for today�s appliance filled households. It�s also important that all wiring and circuit breakers be properly sized for their service. usually from the 1960s or earlier, can easily crumble or flake off the wire. generally required every 12 feet or within 6 feet of any doorway, so extension cords are not needed as often. accessible outside decks and swimming pools. aluminum connections can loosen over time, causing arcs and overheating at switches, outlets and the breaker panel. electrician�s assessment will inform you if there are potential electrical risks, as well as how to remedy any problems. measures to ensure your family�s safety. This will not make me very popular but it is the truth. Without a license, not very much. At The present time most states allow you to do whatever you want in your own home. But doing electrical work yourself is a gamble. How much are you willing to risk to save money. There is a reason why it takes so much training to become an electrician. Do not make a mistake by taking electricity lightly, even the smallest job could be a safety hazard. Why take a chance. Get a professional to do this work. 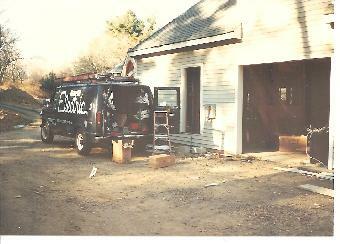 Also In some states the homeowner can pull his own Electrical permit for work in his single family home, what he does not know is that in case of damage or fire caused by his work, his homeowners insurance will not pay, they will only if the work is done by a licensed Electrical Contractor. You should check with your homeowners Insurance Co., and they should sign a document or something to this effect to acknowledge this when they pull a permit. The most dangerous time is when you tell yourself. This is easy. I can do it myself. Why should i get an electrician? Than when you don't remember where all those wires went, or your hair is standing straight up, you say to yourself. Well maybe we better call someone to straighten up this mess. Now it will cost you double what you thought you were going to save in the beginning. More and more insurance companies are refusing to insure homes with Knob and Tube Type wiring. We have been getting a lot of questions recently about this wiring system. History: Knob and Tube Type wiring was installed from the late 1800's until the late 1950's. The type of wire used before about 1930 is subject to deterioration from high heat and air pollution (a big problem on the East Coast but not much of a problem here). Problems: Knob and Tube Type wiring in houses was readily accessible to "Do It Yourselfers" in attics and basements. Because of this, we see a lot of cases of incorrect and often dangerous alterations. Knob and Tube Type wiring is a two-wire system and therefore has no ground wire (meaning no three-prong receptacles can be installed). Lastly and probably the biggest reason that Knob and Tube has such a bad reputation is because it was installed with fuses instead of circuit breakers. It was far too easy for someone to install oversized fuses, or worse yet a penny in the fuse socket. This would allow the wire to become overloaded, which in turn would cause it to overheat. This destroys the insulation and causes the soldered splices to become loose. Both of these conditions create a potential fire hazard. Solutions: If it is possible to inspect the exposed portions of the wiring system and determine that they are in good condition, not overloaded nor altered to an unsafe condition, then the wire can still be used safely. Unfortunately, most insurance companies are not interested in an inspection, but rather insist on its replacement. Rewiring a house with the current standard NMB cable is as much a problem of access as it is an issue of wiring. 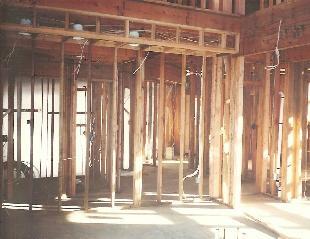 If the house has an unfinished basement or crawl space, we can rewire the main floor receptacles from below. If the basement has a finished ceiling, then it must be removed. In a one-story house we can access the light fixtures and switches from the attic. However, if the house has two or more stories, then there is a problem: there is no way to access the first floor light fixtures and switches without opening the walls and ceilings. Obviously, this adds a great deal of expense and inconvenience to the project. 1. “System Interrupts” puts you in the dark. If electrical circuit-breakers trip often, or fuses blow frequently, your circuits are drawing more current than they can safely provide. This may also indicate a dangerous fault on one or more circuits. 2. The lights flicker and wane. Does your hair dryer give the vanity lamp a moment’s pause? When the fridge or air conditioner comes on, do the ceiling lights dim? Many motor-driven appliances draw lots of current and should be wired on dedicated circuits. If smaller appliances also cause problems, consider adding a 20-amp line to service them.
. There’s an octopus at many outlets. If plug-strips and multi-receptacle add-ons are strangling your outlets, your electrical system is working beyond capacity. Additional circuits with duplex receptacles are needed to restore order— and safety. 4. Rug bumps mess up the carpet. If your living room looks like a snake farm with wires running under the rugs and furniture, a dangerous condition exists, and you definitely need more outlets. If some of those wires are extension cords, the outlets you have are too far apart. Both signs usually indicate that additional outlets are required throughout the house. 5. Three into two won’t go. Many older homes have outlets that won’t accept three-prong grounded plugs. This is a bigger problem than not being able to plug in the microwave oven—it could indicate that your electrical wiring system is not fully grounded, and you’re not completely safe. 6. The old standards just don’t apply. When you remove an outlet or switch cover, do you find bits of black rubber in the box? Are the wires covered in cloth instead of plastic? If you have an older home and the answers are yes, it means the insulation on the wires is antiquated and dangerously deficient for today’s electrical needs. 7. You get a warm, tingly feeling all over. Are outlets, switches or other electrical- system surfaces warm to the touch? Do you see any blackening nearby on the switch plate or wall, switch terminals or wire ends? Does a switch or outlet give a mild shock? The problem could simply be too much demand on the circuit, or something far more complicated and dangerous. If your home was built or wired during the period from 1965 to 1975, it may even have aluminum wiring. If it does, have it checked regularly. 8. It’s not safe to go near the water. Wet locations such as kitchens, baths and utility rooms, as well as grounded areas like your basement or garage, now require outlets protected by Ground Fault Circuit Interrupters, or GFCIs. Easy retrofit installation will make your home code-compliant—and safe. If GFCIs have already been installed near sinks and dishwashers, test their reset buttons to be sure they’re working properly. Rust is slowly taking over. If you begin to notice rust or moisture on or under your home’s main service panel, it’s a sign that something’s going wrong. Deterioration at the panel threatens the main wiring connections within, and could indicate similar problems throughout your electrical panel. If your lights dim when an appliance (fridge, air cond, etc.) comes on, check to see if the lights are on the same circuit with the appliance. Most fixed appliances (fridge, air cond, etc.) should be on a dedicated circuit back to the main panel. These devices draw quite a bit of current in the first second or so when they first start up. If all the lights in your house are dim all the time or periodically, the problem could be at the local utilities substation, transformer or their service feed coming into your house. This is one of the first thing you might want to have checked. Your lights could dim if the wiring in your house is not large enough, it will have too much resistance. When a large current is present in the wire, there will be a significant voltage drop, leaving less voltage available to your lights. If the light in your house dim and also get brighter it could indicate a lot more serious problem, a loose, broken or corroded neutral wire. Electricity is usually delivered to your home via three wires, two hot and one neutral. Each 120 volt circuit taps one hot wire and the neutral. A 240 volt circuit taps both hot wires. If the neutral wire comes loose, there is a risk that the 120 volt circuits will, at least momentarily, be supplied with 240 volts. The problem could be with the utility company connections, the main panel, or the branch circuits. For the three-wire cable, two of the wires will insulated. They are called the "hot" wire (black) and the return wire (white). The third wire is typically a bare or green covered copper wire. The 120 VAC potential will be found on the hot wire, while the return wire should be close to zero potential. Current will flow from the hot wire to the device and return along the return wire. No current flows without a return path. There should always be the same current flowing in the return as there is in the hot wire. But the return is not always at zero potential relative to your local ground. For safety, there should always be a local ground. This is the purpose of the bare copper wire. It should be connected at one end to a conductor that is buried into the ground. All metal electrical casings and electrical outlets should be connected to this wire. If you are burning bulbs to frequently you also might try using lower wattage bulbs. A 40 W bulb has a higher resistance than a 100 W bulb. Both bulbs will have the same voltage, the 100 W bulb must have more current. And that means the 100 W bulb must have a lower resistance. So the filament for the higher resistance 40 W filament must be heavier or have a smaller cross section. There is also a rough service buld that is made with a heavier filament. The best bulb on the market today is the CFL (Compact Fluorescent Lights) (Philips, Sylvania). These bulbs may cost 10 to 15 dollars, but will last about 10,000 hours. Newer light fixtures require that the temperature rating of the wire feeding these fixtures be at least 90 degrees C. This is the temperature rating for these light fixtures. It's important that the temperature rating for the wiring feeding these fixtures match or exceed the rating for the fixture. If the temperature rating of the wiring is lower than the 90 degrees C. required, the insulation around it becomes brittle and may break away. This allows arcing between bare wires, which causes heat that melts the fixture and could be a fire hazard. Look for the letters NMB on the jacket of the wire. The NM means nonmetallic sheath cable (Romex) and the B suffix means that the cable's conductors are rated for a maximum operating temperature of 90�C 194�F. We can assume that wiring made prior to 1984, without the B suffix, is rated at 60�C 140�F. This is the type of wiring found in most older homes that were built before 1982. Here is some information on where to install smoke detectors. Some local codes may vary, so check first. Wall-mounted units should be mounted so that the top of the detector is 4 to 12 inches from the ceiling. A ceiling-mounted detector should be attached at least four inches from the nearest wall. In a room with a pitched ceiling, mount the detector at or near the ceiling's highest point. Place the detector near the bedrooms, within 15 feet of sleeping areas. The National Fire Alarm Code, developed by NFPA, requires a smoke detector in each sleeping room for new construction. it is a good idea to place one on each level of the house. Also additional detectors can be installed near the furnace and washer and dryer. Because smoke rises, mount detectors high on a wall or on the ceiling. Place them in an area away from air vents The basement ceiling near the steps to the first level is a good location. But don't install the detector at the top of the basement stairs where there is a closed door, dead air space near the door may prevent smoke from reaching the detector. There is more to checking a smoke detector than just pushing the test button. Dust and even small insects can sometimes block a photoeye type or ionization type of smoke detector. They also should be cleaned periodically. Dont go to long before changing batteries. If they are hard wired make sure they have a battery back up. Smoke detectors should not be taken lightly. They could save your life. The utility transformer feeding your service is 240 volts single phase. In order for you to have 120 volts they need to split the voltage with a center tap at the transformer called the neutral. This is the third wire brought to the neutral buss in your main panel. This wire is also referred to as the grounded conductor. The grounding conductor is the wire attached to the water main or electrode and than to your panel and is used to ground your electrical devices. The neutral or white wire in your circuit is the return for the live feed from your circuit and is bonded at the main panel to the grounding conductor so that any stray currents caused by equipment faults will go back to the utility transformer. "The question we seek to answer is, why is there a residential electrical fire problem in the United States when we have such a good electrical code?" said Kathleen Almand, P.E., executive director of the Fire Protection Research Foundation in Quincy, Mass., which is overseeing the Residential Electrical System Aging Research Project. Each year, electrical distribution systems and lighting equipment are involved in an estimated average of 32,000 home fires reported to U.S. fire departments. On average, these fires cause 950 injuries, 220 deaths and nearly $674 million annually in property damage per year, according to the National Fire Protection Association. With one-third of U.S. housing - some 30 million homes - built more than 50 years ago, it seemed logical to examine the ravages of time on wires, connectors and outlets in looking for patterns in the causes of electrical fires. "This is an important project and one that's never been done before," said John Drengenberg, Consumer Affairs Manager for Underwriters Laboratories (UL). "Residential electrical systems are seldom inspected after they are installed and they tend to be destroyed in house fires." UL, the independent product safety testing and certification organization, is a sponsor of the Residential Electrical System Aging Research Project. UL is also responsible for testing the wires, connectors, outlets and switches "harvested" from the abandoned house walls. Engineers at UL's headquarters in Northbrook, Ill., are comparing durability in various wiring technologies that were cutting edge in their day. The results will provide critical information to code writers, both in the electrical and fire protection arenas. The goal of the $412,000 Residential Electrical System Aging Research Project is to have samples harvested from 100 homes scheduled for demolition throughout the United States by late 2007. So far, 10 homes in Alabama, northern Illinois and Wisconsin have been harvested. These homes were built in the 1920s, '50s, '60s and '70s. "The good news is that electrical systems are robust. They'll take a pretty good beating and hold up," said Donny Cook, chief electrical inspector for Shelby County, Ala., and a harvester for the study. But homeowners should not assume all is well simply because their fuses aren't blowing or they're not receiving shocks or smelling burning plastic, Cook warned. "It's worth the effort and a little bit of money to have these older electrical systems inspected." Inside the walls, wire insulation could be cracking and crumbling, especially if the wires are drawing more current than they were designed to handle. Or the wood frame above the plaster ceilings might become charred by light bulbs that are too close to the ceiling or higher in wattage than the light fixture's rating. "Those things could be happening, but because the light still burns and the vacuum still works, everything seems to be functional," Cook said. "Then that one magic moment comes when your home catches fire." To avoid such hazards, consumers should understand the limits of their wiring systems. Some of this will depend on when the home was built or if the electrical system was upgraded, but in other cases telltale signs can predict that something is wrong. "Anytime you receive a shock from an electrical appliance, outlet or wall switch in your home, it's a warning sign that you may need to talk with a qualified electrician," Drengenberg said. "If a fuse blows or a circuit breaker trips right after you replace or reset it, there's a problem somewhere. Flickering or dimming lights could mean loose connections, overloaded circuits, improper wiring or arcing and sparking inside the walls." Older homes may have newer wiring systems, but the era when that wiring was installed and how well it was installed will have bearings on a home's electrical limitations. Before buying a home, especially older homes, have someone certified in electrical work inspect the electrical system. Contact the National Association of Certified Home Inspectors for referrals. Electrical capacity is a major concern with older wiring systems. Homeowners in the 1930s didn't have a lot of electrical appliances, except for maybe a few lights and a radio, which didn't require a lot of juice. That started to change in the '40s and '50s, but then the popularity of air conditioning in the '60s and '70s rendered many mid-century electrical systems obsolete. Even homes built as little as 20 years ago might have insufficient power for today's entertainment and personal computer systems. "If your TV or computer screen wavers whenever another appliance is turned on, you might need additional electrical capacity," Drengenberg said. In older homes, a sign that you are drawing too much current through your electrical outlets is heat. "If your receptacles or plugs are hot to the touch - you can't keep your hand on them for more than five seconds - you may have an overload," Drengenberg said. When too much current is drawn through the wires, the wires heat up, baking the insulation and eventually destroying it. Wire with damaged, decayed or brittle insulation can lead to shocks and fires. Another issue with older home wiring systems is the number of receptacles in each room. Today's electrical code requires that outlets be placed every 12 feet of running wall space, about one per wall in the average 10-by-12-foot room. Houses built before 1956 were required to have outlets placed every 20 feet and homes built before 1935 weren't required to have wall outlets at all. "Too many appliances plugged into a single outlet could mean that your house does not have a sufficient number of receptacles," Drengenberg said. "Relying on extension cords is not the answer. Extension cords are meant for temporary use only and should not be a substitute for permanent wiring." Homeowners also should be aware that electrical code enforcement is the responsibility of local government, be it state, county or municipality. Some areas of the country don't require electrical inspection when a home is built, nor do they enforce national electrical codes during that construction. Others places started electrical code enforcement as little as 20 years ago. To learn whether your community has electrical inspectors and how long electrical codes have been enforced there, start by contacting your local governing board. Finally, there is the issue of grounding. Grounding prevents painful or even deadly electrical shocks when electricity flows through an improper path. Every home electrical system should have some type of grounding ability. Newer homes are wired with cables that include a ground wire. The ground wire allows for the use of the three-pronged receptacles that are needed to power certain appliances, particularly ones with metal shells, such as refrigerators and washing machines. Many wiring systems installed in the 1950s and earlier used non-metallic wiring, which lacked a ground wire. Homes from this era have only two-pronged outlets, unsuitable for many modern conveniences. Simply replacing two-pronged receptacles with three-pronged receptacles is a violation of the National Electrical Code� if there is no ground path present. Around 1970, ground-fault circuit-interrupter (GFCI) protection was added to the electrical code. Found mostly in areas where people are likely to be outdoors or near water - swimming pools, bathrooms, garages, basements, kitchen countertops - GFCI protection is designed to trip before a deadly electrical shock can occur. Just 25 years after the GFCI was introduced, the number of accidental electrocutions in the United States had been cut in half, even though electricity use had doubled. The most recent electrical protection technology added to the NEC� occurred in 2002, when the arc-fault circuit-interrupter (AFCI) circuit-breaker was required for bedroom outlets. Bedrooms were selected because of their history of electrical fires.